Learn more about the Celestial Madonna! After a childhood of training by the Priests of Pama—a Kree religious sect that believed she would grow up to become the Celestial Madonna, the mother of their savior—Mantis made her way out into the world. With altered memories leading her to believe she grew up an orphan in Ho Chi Minh City, she became a barmaid at a local watering hole, where she soon met The Swordsman. 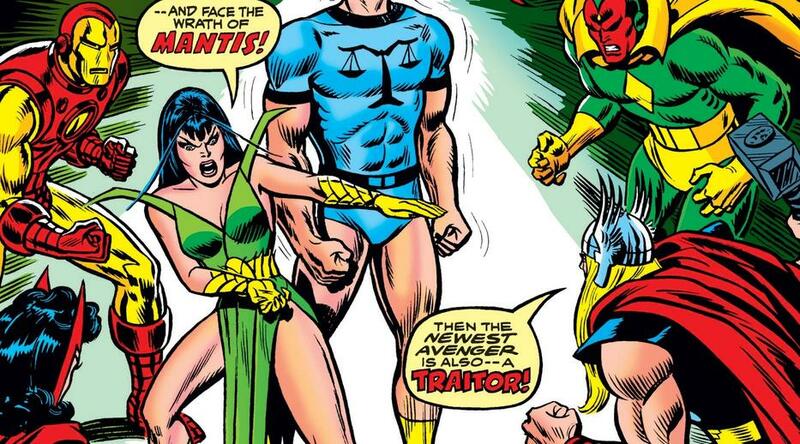 Encouraging The Swordsman to give up his criminal ways, Mantis eventually traveled with him back to America to offer her support in his attempt to rejoin the Avengers. Once he was readmitted, she also began to join the team on missions, where her empathic abilities proved useful. 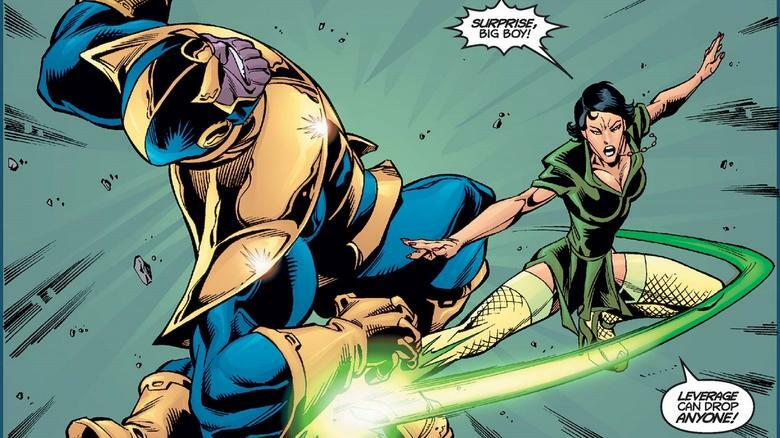 She would go on to aid them in the Avengers-Defenders War, and in battle against the likes of Thanos. After learning some of her own history from her father—the criminal known as Libra—Mantis traveled back to Vietnam and found the temple where the priests raised her. When she arrived, however, she found them all murdered. Even though she couldn’t delve further into her supposed past, she still felt a connection to the temple for a reason she couldn’t define. When The Swordsman sacrificed himself to save Mantis from Kang the Conqueror, she returned to the temple once more to bury him in the garden there. But the eldest of the Cotati—a race of telepathic, sentient plants the Priest of Pama protected at the temple—reanimated him and confirmed Mantis’s destiny as the Celestial Madonna. With her true memories restored, Mantis accepted the role of Celestial Madonna and married the Eldest Cotati. He transformed them both into energy, merged their essences, and departed Earth to conceive the Celestial Messiah. Upon regaining her physical form, Mantis found she had gained several new abilities. As she assumed more plant-like features, her skin developed its recognizable green hue. She went on to give birth to her son, Sequoia, now destined to become the Celestial Messiah. Mantis did everything in her power to raise him as a normal child, even settling back on Earth in Connecticut. She worked in secret with other heroes to continue as the Celestial Madonna, protecting life and ending threats against her son. When Sequoia “came of age” as the Cotati saw it, the plant creatures returned to Mantis, taking him from her. They intended to help him realize his plant aspects and Cotati heritage to understand his purpose as the Celestial Messiah. A frustrated Mantis returned to space, seeking new adventures and continuing to do good wherever she felt she could. 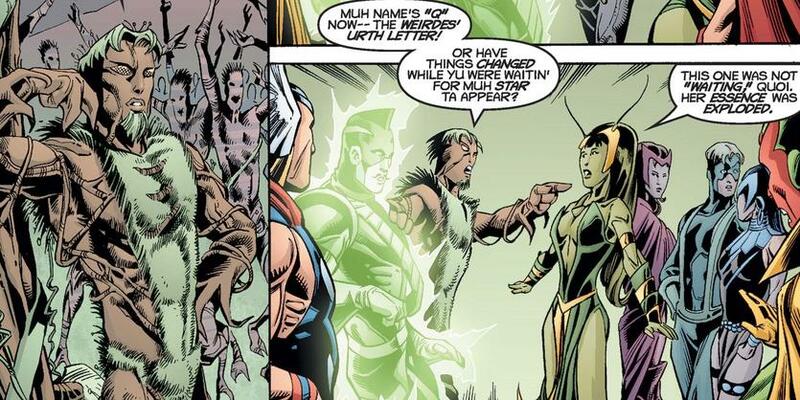 With the help of the West Coast Avengers, Mantis regained her memories after returning to the temple of her childhood. Over time, the other scattered fragments began to coalesce into five distinct forms that represented different primary aspects of her personality. Each of these formed on Earth, as if they were destined to become one whole being again. Thanos sped up this process by tracking down and killing Mantis’ various forms. Having heard a prophecy foretelling the rise of a new Celestial Messiah, he sought to eliminate Mantis in hopes of preventing it. 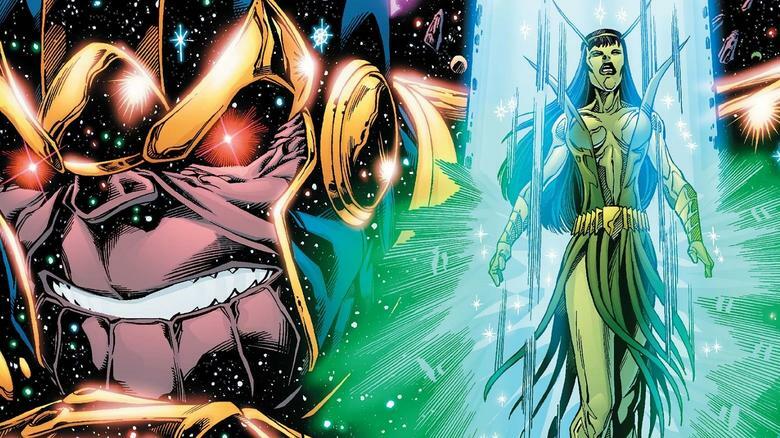 Unbeknownst to Thanos, not only had the Celestial Messiah already been born, but eliminating Mantis’ duplicates returned her powers and brought back the Celestial Madonna. After being reborn, Mantis sought out her son. They were quickly reunited, but he was soon kidnapped and held in the Rot. Mantis traveled there with Vision, but they became trapped, along with Thanos, who was still trying to kill Sequoia. Thanos and Lady Death destroyed the Rot, freeing everyone trapped in it. Mantis and Sequoia then parted ways as he prepared to become the Celestial Messiah. After suffering a grave injury from an Ulton-derived Phalanx, Mantis spent a great deal of time healing. Once recovered, she helped Star-Lord reunite the Guardians of the Galaxy and continued to travel with them for a time, aiding in the War of Kings, and fighting against the Cancerverse threat. Eventually, Mantis left the team and continued traveling through space aiding in the protection of life, doing what she could to uphold the mantle of Celestial Madonna. Later, she joined up with the Knowhere Corps, a group of vigilantes who appointed themselves protectors of the important interdimensional hub and scientific observatory.